Everyday Ruralty: What's a cowgirl to wear? What's a cowgirl to wear? This is the second month of horse shows for NeighGirl (D3). I wasn't prepared for the things she would need for the show. I grew up with "tally-ho", not "yee-haw"! When showing Western there are certain requirements for attire. 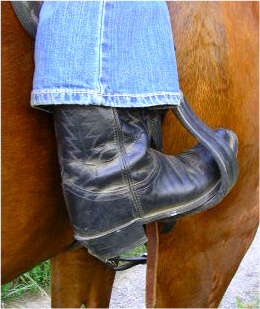 Boots, jeans, a show shirt, and hat/helmet are a minimum. There are things like chaps too, but let's stick to the basics. Did someone say show shirt? "Hey, Mom. Look at this show shirt online. It's only $85." My reply, "That's pretty, but it's too expensive." "Mom, you should see the ones that are $245!" "No. I shouldn't see that. No one should see that. It's too expensive." My daughter wasn't asking for the fancy shirt, but she had found lots of listings online and some went into the thousands. There's no way we could buy a fancy shirt and it hardly seems practical when my young lady is growing faster than a plant in fertilizer! So it was time to stalk the thrift shops. The second day that I visited a shop was successful. I scored well. I found this sparkly, tacky thing on the dollar rack. The detail on the front yoke had potential. a thin teen when I cut the shirt down. Bye-bye pockets! I took apart the side seams and readjusted the way the sleeves were attached at the shoulder. Then I took the thing in- and in- and in. D3's a skinny one. I washed some blue ribbon and went crazy pinning it to the front yoke area of the shirt. Once I liked the pattern, I sewed the ribbon on. I wasn't sure I could navigate between the rhinestones, so I sewed it by hand. I almost didn't remember how. I always go to the machine for sewing! This is not Wendell. It's his 75th cousin, 452 times removed. This is Moe. He's 100% Haffy. D3 was happy with the shirt and even the judge complimented her. I'm happy that the whole project cost me $3! You go girl!! It looks great! Oh, how I love thrift stores!!! And...if there's a Goodwill in your area...if it's like ours up here in good ole Tennessee...this coming weekend is half-price...Thursday, Friday and Saturday!!! The shirt was perfect for your cowgirl. Love the idea. And there is nothing that compares to a great bargain. Good job. Way to go, mom! The shirt is spectacular. I wish Pippin would have the sweet head carriage that Moe is demonstrating. Good for her! And for mum! It looks fabulous. That was GREAT! I couldn't have done that but thank God for my mother who was just like you! She could turn anything into something marvelous too! She still does! Did Wendell tell you we talked yesterday? What a sweetheart! Whoo-hoo! Go D3! If you're ever looking for one of those flashy show shirts, let me know. I have two and a pair of chaps from when I showed in college that I don't use anymore (or ever will). One shirt is a Hobby Horse one and the other was a custom-made one, but it's just like the name-brand ones. I'm not really looking to get much out of them, just to get them outta my closet! Awesome! I love a crsp white shirt and that blue trim turned out great! Also love those boots. I am a sucker for a pair of cowboy boots.